It not only purifies - it detects and removes pollen, it , it sanitizes and then it revitalizes the air in your home or office-all because of the 9 technologies used in the Alive Air Machine. 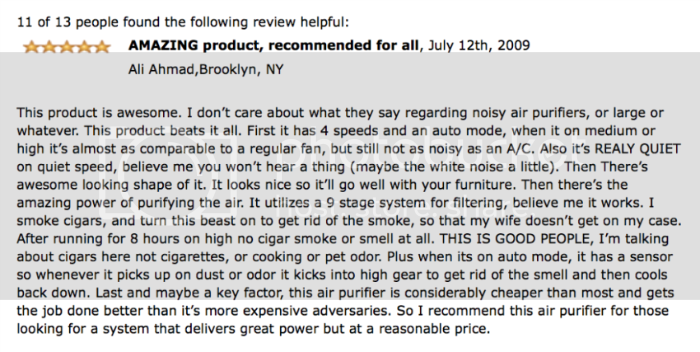 That's why it's the Best Allergy Air Purifier 2013. If you’re serious about cleaning the dirty air inside your home and office you need a couple of handfuls of the very best technologies built into your air purifier. One, two or even three technologies won’t do. That’s not nearly enough. The air is just too dirty. And yet that’s all the technologies being used in most of the air purifiers on the market today. But with the Alive Air Machine you have 9 leading edge technologies built into the machine. That's why it's the Best Allergy Air Purifier 2016. And you can purchase it for half the cost of a comparable brand name purifier. Q: Will the Alive Air Machine really help relieve allergies? A: It's exceptional for allergies.First you have HEPA, recommended most by Doctors because it traps pollen and dust. But because allergies signal a weak immune system you want to remove other immune threats like mold, mildew, viruses and germs which can all trigger allergies. That's why HEPA alone won't do it. It's best to have all 9 Alive Air technologies working to rest and protect your immune system. 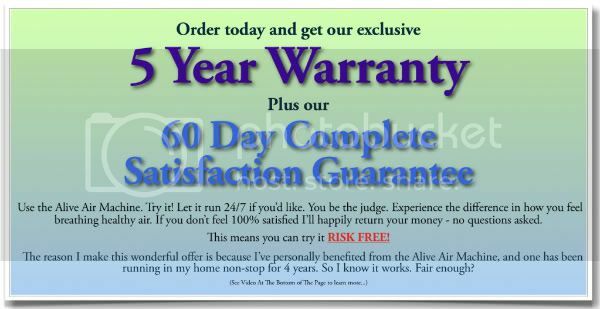 Q: How does it compare to the infomercial brands and the expensive HEPA air purifiers when it comes to reliability? A: Great question. We believe (and know from our customers) that our product is much more durable that others. We've continued to improve it's design over 6 years to make it so (We've had one of the Alive Air Machines running continuously in our office for almost 5 years. It still runs great!). That's why we believe it is the Best Allergy Air Purifier 2013. Q: What is your shipping policy? A: We ship Fedex Ground directly from our warehouse, and usually get your order to FedEx within 3 Business Days. Then it takes 2-5 days from the time we ship (faster for the West Coast, slower to go east). We include a secondary quality control before we ship any alive air machine out to insure that everything is working to specs. If you need faster service please consider the 2nd Day Delivery options. Q: Can I talk to a person live before ordering. A: Yes. We'd love to help. You can call us at 1-800-215-1689 . Q: What kind of tests have been done? A: We've done many over the years [See the mold and sewage test in the middle of this page]. Besides our 30 years in the industry the list below shows some of the certifications we have put the AliveAir through. It includes some of the most stringent tests for quality and safety.